Red shopping bags represent a wonderful color for making a bold statement. Red is the obvious choice for any retail packaging option ranging from intimate apparel to Christmas seasonal. 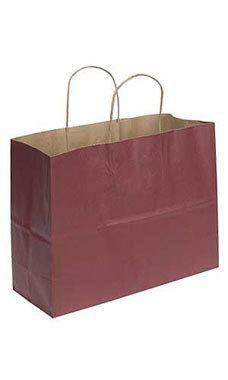 Our red shopping bag is a rich dark red comparable to the color of brick. A versatile product, this mid size bag can be used in a variety of ways ranging from retail apparel to handbags. We also offer custom paper bags where you can add your logo, messaging and more. Check out all of our Custom Creations to build a comprehensive look that will make your store stand out from the competition!